A contract (implied, oral or written) is a legally enforceable agreement between two parties. 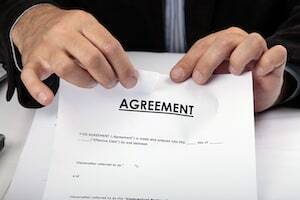 A valid contract includes agreement on the terms and conditions, intention of the parties forming the contract, and the contract is supported by consideration. A breach of a business contract can have a serious impact on the company’s current and future operation. For most businesses, their operation is only as strong as the agreements it has made with other vendors, businesses and individuals. When one party to the contract fails to honor his or her obligations (breach of contract) it can be devastating and costly for the business. The commercial litigation attorneys at KALIS, KLEIMAN & WOLFE know that when a breach of contract occurs immediate and strategic action is needed to mitigate the impact of the broken contact. We have represented Fortune 500 Companies, multinational corporations, professionals, entrepreneurs and small and medium sized businesses in crafting, revising and providing advice regarding the agreement process. When and where possible our goal is to proactively mitigate the risk of future business disputes through the creation of comprehensive business agreements and in a situation where it is too late for proactive legal counsel, we are ready to assist and litigate if necessary. If you are faced with a business dispute or breach of contract and need guidance on any contract need, contact the experienced Commercial Litigation Attorneys at KALIS, KLEIMAN & WOLFE, the South Florida-based commercial litigation law firm today at (954) 791-0477.